The study of non-human animals as other-than-human persons (including animal-spirits and divine animals) has marked a significant shift in the ethics and politics of the academic study of religion. Charming Animals and Frightful Beasts investigates how South Asian religions, with their sacred narratives, ritual and non-ritual practices and performances, bear witness to the active presence of non-human animals as both culture makers/bearers and symbols of spirituality. With bourgeoning debates on religion, indigeneity, ecotheology and environmentalism, this volume urges for a promotion and an in-depth analysis of the roles and places of animals in South Asian traditions. The structure of the book reflects that of the most popular collection of folktales on animals in South Asia, the Pañcatantra. Such an arrangement creates the backbone for an articulate, clear and reasoned discussion on animals and the concept of animality in different South Asian traditions, or various aspects of the same tradition. Like the original Sanskrit text, the volume is divided into five books (tantras), each dealing with themes as different as South Asian animals as divine messengers, restorers of order, symbols of cultural identity, exemplary beings, spiritual teachers, objects of human reverence and portents symbolizing the life cycle, including its inevitable end. This book offers a rich discourse of the animal, and brings forth the fundamental reconsiderations of nonhuman and human difference, otherness, and subjectivity. Each article in this volume gives us a quick but intriguing glimpse of an often unfamiliar (sub-) culture from a unique angle. Charming Beauties and Frightful Beasts considers representations of animals in South Asian narratives as subjects, objects, symbols and signifiers. In doing so this edited book poses important questions about the nature of culture itself and the role of power and ethics within it. 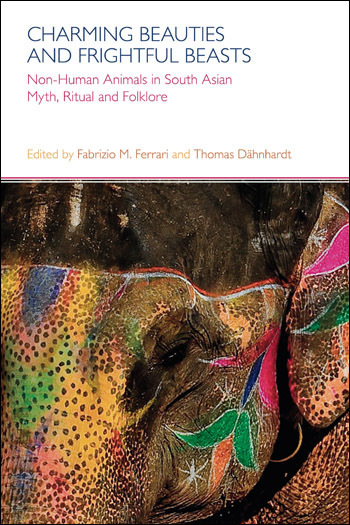 The text's concentration on folk narratives, through literature, arts, myth and ritual, is important in making this a particularly valuable contribution to the developing cultural discourse of ‘animal studies’, paying heed to the south Asian multiplicity of religions and communities. The book's objective to explore the ways in which animals have shaped human paradigms and alternative worldviews is met with rich and varied.contributions. On the whole this volume offers food for thought to the current conversation on animals. Even if animal voices still simply reflect human desires and human traits, fortunately for us, some of the contributions encourage us to rethink assumptions that the animal is mute, and its representations merely constructions of the human, as its other.